This CellML model runs in OpenCell to recreate the published results (figure 2C from the published paper). The model needs to be run for 160 hours with a step size of 0.1 hours, and MP, MB and MC are plotted. Ignore the first couple of oscillations as the model needs to stabilise. Also please note that in the version of the model presented here, parameter set 4 from the original paper has been used. The units have been checked and they are consistent. ABSTRACT: We extend the study of a computational model recently proposed for the mammalian circadian clock (Proc. Natl Acad. Sci. USA 100 (2003) 7051). The model, based on the intertwined positive and negative regulatory loops involving the Per, Cry, Bmal1, and Clock genes, can give rise to sustained circadian oscillations in conditions of continuous darkness. These limit cycle oscillations correspond to circadian rhythms autonomously generated by suprachiasmatic nuclei and by some peripheral tissues. By using different sets of parameter values producing circadian oscillations, we compare the effect of the various parameters and show that both the occurrence and the period of the oscillations are generally most sensitive to parameters related to synthesis or degradation of Bmal1 mRNA and BMAL1 protein. The mechanism of circadian oscillations relies on the formation of an inactive complex between PER and CRY and the activators CLOCK and BMAL1 that enhance Per and Cry expression. Bifurcation diagrams and computer simulations nevertheless indicate the possible existence of a second source of oscillatory behavior. Thus, sustained oscillations might arise from the sole negative autoregulation of Bmal1 expression. This second oscillatory mechanism may not be functional in physiological conditions, and its period need not necessarily be circadian. When incorporating the light-induced expression of the Per gene, the model accounts for entrainment of the oscillations by light-dark (LD) cycles. Long-term suppression of circadian oscillations by a single light pulse can occur in the model when a stable steady state coexists with a stable limit cycle. The phase of the oscillations upon entrainment in LD critically depends on the parameters that govern the level of CRY protein. Small changes in the parameters governing CRY levels can shift the peak in Per mRNA from the L to the D phase, or can prevent entrainment. The results are discussed in relation to physiological disorders of the sleep-wake cycle linked to perturbations of the human circadian clock, such as the familial advanced sleep phase syndrome or the non-24h sleep-wake syndrome. 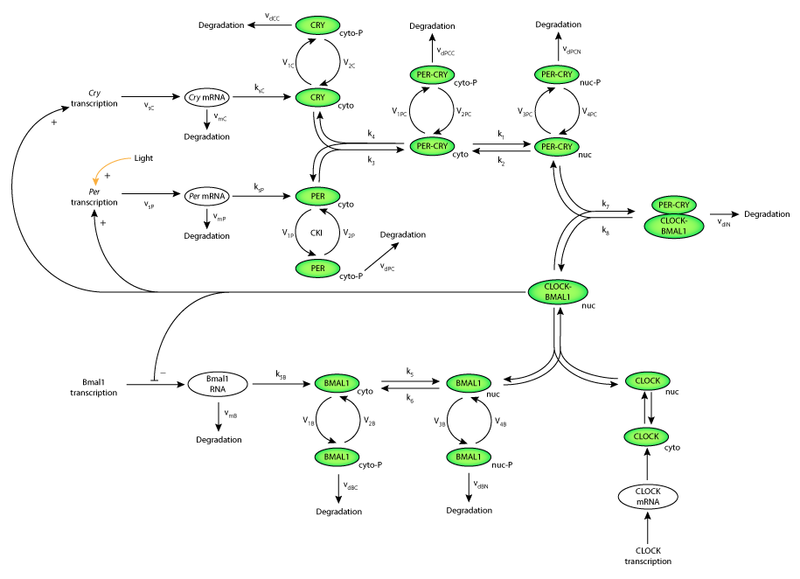 Schematic diagram of the model for circadian oscillations in mammals including positive and negative feedback on the transcription of the Per, Cry and Bmal1 genes by their protein products. Per, Cry and Bmal1 are transcribed in the nucleus and are then transferred to the cytosol where their proteins are translated and the mRNAs are degraded. Light increases the rate of Per transcription. Derived from workspace Leloup, Goldbeter, 2004 at changeset e12c13b3c70b.